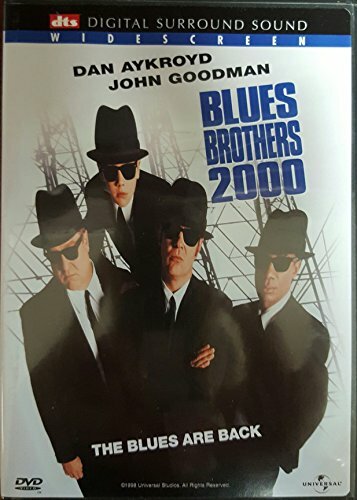 Eighteen years after the Brothers' original "mission from God", Elwood Blues (Dan Aykroyd) is getting out of prison and discovering that much has changed in the time he's been away. His partner, Jake, is gone, his band is no longer together and the orphanage where he grew up has been demolished. Elwood soon realizes that he must embark on a whole new mission - to reassemble the old band, this time with the help of a soulful bartender (John Goodman), compete at Queen Moussette's (Erykah Badu) Battle of the Bands and set a wayward orphan named Buster on the path to redemption. In the midst of the mayhem, he's got to prove to the police that there's magic in the music...and a mysterious method behind the Blues Brothers' madness. Special appearances by B.B. King, Aretha Franklin, James Brown, Johnny Lang, Blues Traveler, Eric Claption and many more. It's an action-packed comedy with lots of Rhythm and Blues. If you have any questions about this product by Universal Pictures Home Entertainment, contact us by completing and submitting the form below. If you are looking for a specif part number, please include it with your message.